Hidden within the sagebrush covered hills and badlands of eastern Oregon is evidence of past worlds covered by ancient forests and inhabited by strange looking beasts. Although paleontologists have been studying the area for nearly 150 years, the forces of erosion still uncover previously unknown plants and animals buried within the rocks. Many of the most dynamic finds from the John Day Fossil Beds are on display at the Thomas Condon Paleontology Center at the Sheep Rock Unit of the monument, where visitors can peer inside the fossil laboratory as paleontologists work on new finds. John Day Fossil Beds National Monument preserves over 40 million years in a fossil record representing nearly two-thirds of the Cenezoic Era, the Age of Mammals. It is not just the breadth of time covered that makes this area unique, but also the ability to radiometrically date the rock layers, and thereby the fossils, with a high degree of accuracy. As this area slowly changed from a semi-tropical forest to the sagebrush steppe environment of today, plants and animals evolved, migrated in or out of the area, or went extinct. By comparing the fossil record here with other sites from around the world, paleontologists are able to see how the plants and animals of this place fit into the larger picture of life across the planet. 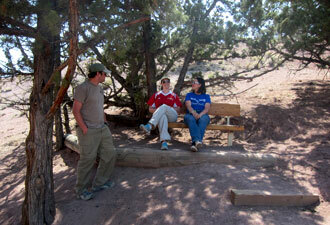 Scenic views and trails await visitors at all three units of the monument. The Clarno Unit, located near the town of Fossil, holds the oldest fossils. Bananas, avocados, and palm trees once covered the land. Small primitive horses, lumbering brontotheres, ancient crocodiles, and carnivorous creodonts weaved amongst vine covered, semi-tropical vegetation. Leaves and wood still caught in the hardened remains of volcanic mudslides from this ancient world can be seen from the Trail of Fossils, the only trail in the monument where visitors can see fossils still in place. 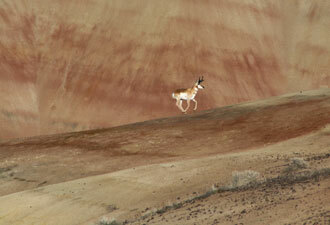 The Painted Hills Unit, near the town of Mitchell, is best known for the banded colors of the hills. Few people walk away without taking multiple photos.Fossils contained within some of the hills remain from the temperate deciduous forest that developed as the area cooled. This ancient forest contained trees that are familiar, but are largely absent in this area today, such as oak, hickory, elm, and maple. Metasequoia (dawn redwood) leaves, Oregon's official state fossil, have also been found in large numbers within the Painted Hills. 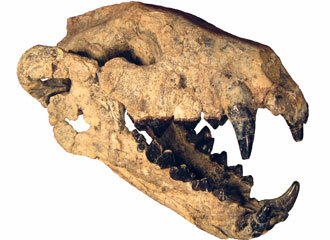 This entire family was believed to be extinct until living members were found in China. The Sheep Rock Unit, near the town of Dayville, has extensive and scenic exposures of multiple fossil bearing rock layers. These layers record a rich array of animal life, and fossils from this area have played a key role in helping paleontologists understand the evolution of horses and dogs. Fossils from all areas of the monument are displayed at the Thomas Condon Paleontology Center, which is also the visitor center. Regional history is featured at the historic Cant Ranch. Numerous short hiking trails take visitors to views of the unique geology and scenery of the area, including blue-green rocks that have no copper or a historic orchard where people are welcome to try out the heirloom fruit. From the green rocks and paleontology museum of the Sheep Rock Unit, to the brightly banded exposures of the Painted Hills, to the ancient mudslides that formed the towering Clarno Palisades, there is spectacular scenery with a hidden history waiting to be found at John Day Fossil Beds National Monument.